"Thor: Ragnarok" secured a third straight week at the top of the Korean box office this past weekend. 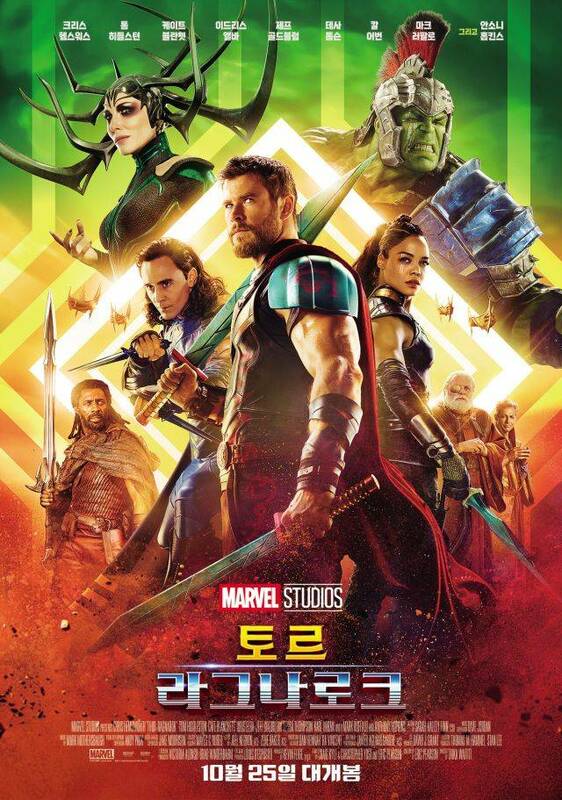 Released late October, the third "Thor" film in Marvel's Cinematic Universe dislodged the local sleeper hit "The Outlaws" after Chuseok, and now, with the 465,780 admissions (25.89%) it claimed here, "Thor: Ragnarok" has banked $30.9 million (4.2 million admissions) in Korea alone. Worldwide, Taika Waititi's more comedic version of the popular Marvel franchise has grossed $650 million: currently the tenth highest-grossing film of 2017. The American slasher "Happy Death Day" by director Christopher B. Landon was the highest new entry this week. From 714 screens, "Happy Death Day" attracted 412,409 admissions (22.55%). The film, which has been described as something between "Groundhog Day" and "Scream", was produced for just $4.8 million and has grossed over $88.2 million internationally. The success of Landon's thriller meant that last weekend's number two, Chang You-jeong's comedy-drama "The Bros" (starring Ma Dong-seok, Lee Dong-hwi, and Lee Honey), was bumped down one place to third. Last weekend "The Bros" entered the fray with 605,681 admissions from 889 screens; in week two, Chang You-jeong's sophomore film brought in an additional 307,215 admissions (16.56%) from 728 screens. Chang You-jeong's first film, "Finding Mr. Destiny" (Im Soo-jung and Gong Yoo), claimed 1.1 million admissions back in 2011, which "The Bros" has now surpassed with 1.2 million ($9.1 million). Kang Yoon-Sung's action crime film "The Outlaws" (Ma Dong-seok and Yoon Kye-sang) may not have officially won Chuseok weekend, but it has had incredible staying power as is enjoys its sixth weekend in the upper echelons of Korea's top ten. Kang's latest (also known as "Crime City") is now the fourth highest-grossing of the year with 6.6 million admissions ($48.8 million), $1.3 million of which (174,017 admissions) came from this, the second weekend of November. The highest new local entry was up next in fifth. "A Special Lady" is director/screenwriter Lee An-gyoo's debut feature film and tells the story of one woman (Kim Hye-soo) who has to fight against a ruthless patriarchy in order to protect her only son. The film claimed 7.67% of the sales (139,692 admissions), more than double that Jeong Ji-woo's eighth film, "Heart Blackened". Jeong's 125-minutes crime thriller fell two places with 61,046 admissions (3.35%), followed by the local drama "The Preparation" by Cho Young-jun, his debut, with 56,434 (2.88%). "The Preparation" follows a terminally ill grandmother (Go Doo-shim) who has to slowly say goodbye to her family, especially her 'intellectually disabled' son (Kim Sung-kyun). Dorota Kobiela and Hugh Welchman's animated biography about Vincent van Gogh, "Loving Vincent" (Douglas Booth), which was partially funded through a successful Kickstarter campaign and premiered at the 2017 Annecy International Animated Film Festival, arrived in Korea in eighth with 40,408 admissions (2.22%). The Japanese film "Doubutsu Sentai Zyuohger Returns: Give Me Your Life! Earth Champion Tournament" took the penultimate spot with 36,359 (1.81%), and the final place went to another Japanese film, Sho Tsukikawa's "Let Me Eat Your Pancreas", with 35,257 (1.98%). [Photos + Video] New stills of Nana and a video of proper theater etiquette for "The Swindlers"